Umberto Antonio Tozzi (born 4 March 1952) is an Italian pop/rock singer and composer, born in Turin. His most internationally famous songs are "Gloria" and "Ti Amo". In 1976, he released his first album, Donna amante mia ("My loving woman"), from which came the single "Io camminerò" ("I Will Walk") which at the time had been sung with great success by Fausto Leali. In 1977, one of Tozzi's most famous songs was released – "Ti amo". It stayed at number one on the Italian charts for seven months, outselling every other record, and went on to become an international success throughout continental Europe. It also made some inroads in the Americas and Australia, primarily in discotheques. The single was awarded a gold record award in Australia, despite the fact that it only made number 25 on the charts there in late 1979 (source: Kent Music Report, 1980). By late 1980 he releases "Stella Stai". 1978 saw the release of Tu, another hit in Italy. The following year Tozzi recorded perhaps his most famous song, "Gloria". It was a huge success in Italy in 1979 and 1980. The cover version by American singer Laura Branigan first brought Tozzi's name to attention in the USA in 1982. Branigan worked with the arranger and keyboardist of Tozzi's own version, Greg Mathieson, who co-produced her version with Jack White, to give the song what she called "an American kick." The song reached the top of the charts, going gold and platinum in several countries and lasting on the US pop charts for 36 weeks. Branigan's vocal performance of "Gloria" was nominated for a Best Pop Vocal Performance, Female Grammy Award (alongside Linda Ronstadt, Olivia Newton-John, Juice Newton, and that year's winner, Melissa Manchester); "Gloria" marked Branigan's only solo nomination. She would go on to record two more Tozzi compositions, "Mama", and "Ti amo", her version of which went top 5 in Canada and Australia two years after "Gloria". 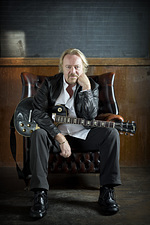 The early years of the 1980s saw the release of the album Tozzi, recorded in concert with a band of American musicians – his first live record. After a period of absence from the music scene, Tozzi returned in 1987 and won the Sanremo Music Festival with "Si può dare di più" ("More can be given"), sung with Gianni Morandi and Enrico Ruggeri. 1987 was also the year of "Gente Di Mare'"("People of the sea"), performed with Raf at Eurovision, which saw them take third place. In 1988 Tozzi released his second live album, The Royal Albert Hall. In the 1990s, Tozzi continued to record, resulting in songs such as "Gli altri siamo noi" ("We are all the same"), the album Equivocando ("Misunderstanding"), Il grido ("The outcry") and Aria e cielo ("Air and sky"). He also released a greatest hits compilation, Le mie canzoni ("My songs"). In 2000 and 2005, he performed "Un'altra vita" ("A different life") and "Le Parole" ("The words") at the Sanremo Music Festival. Between the two participations, he released a duet with French singer Lena Ka of his classic "Ti amo" as "Ti amo (Rien que des mots)". Tozzi also released another greatest hits compilation, a 2-disc set entitled The best of, and another single, "E non volo". In the course of his career, Tozzi has sold more than 45 million records.